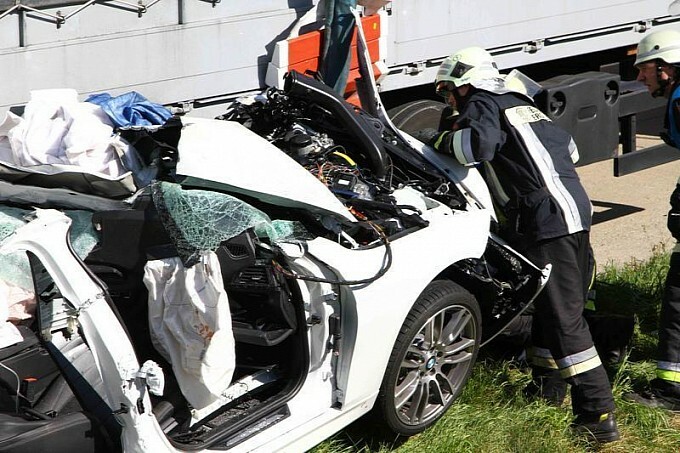 Home Auto News Test driver died while testing a Bmw prototype at top speed! You know that once in a while sad events do happen and that’s the case for today’s news from the auto world. The auto manufacturers always have test drivers and being one is fun but in other cases it can even kill you so that’s why, being a test driver goes in the dangerous jobs section; There are lots of risks involved! So, as others, BMW or Bavarian Motor Works, when it produces a new let’s say Bmw 3 series, needs to test its Bmw prototype to estimate the average fuel consumption, top speed and much more, but for that, Bmw has a test driver! While testing the new Bmw 3 series prototype on Autobahn, a 45 year old test driver died near Bmw’s Dingolfing plant! 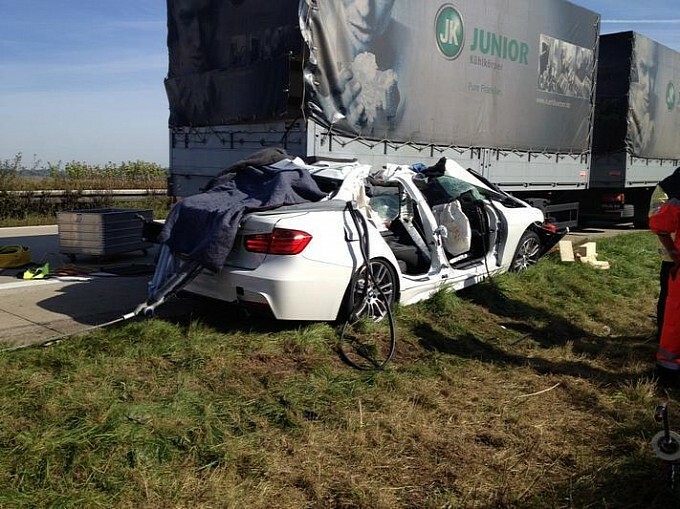 It seems that the test driver pushed the throttle too much and when he passed several trucks on the Autobahn with his Bmw 3 series hybrid prototype, another truck pulled out and when he tried to avoid the car crash, the Bmw prototype went under the trailer’s wheels. Sadly, the test driver died on impact and you can understand why when looking at the photo gallery. When you think of Bmw, you’ll always get that feeling of car care technology; Care of cars and car safety is their first concern and you’ll always get good customer service from their team of professionals. Usually, a german auto is a solid car but the single items which survived after this sad car accident that took the test driver’s life, were the alloy wheels and the car’s rear with its boot lid. As you can see from the car photo, even the car engine was destroyed and we all know that an engine is made out of strong components. 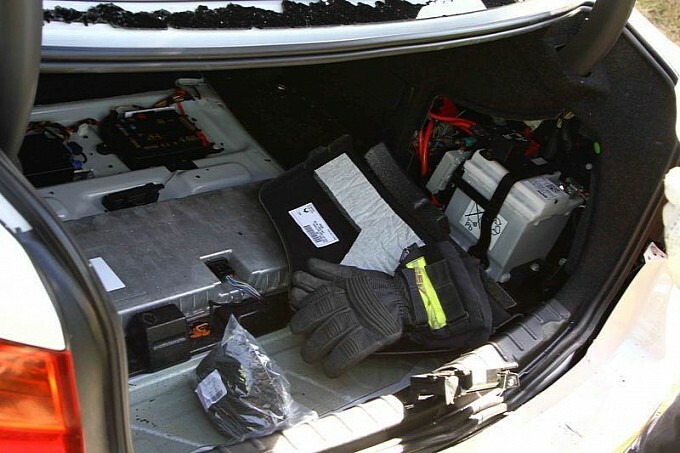 I’ve said that the wrecked car seemed to be a hybrid prototype because, if you take a look at the car pictures, you’ll see that the car’s trunk was filled with car batteries and other electrical stuff. As you can see from this youtube video, a typical Bmw 3 series can save lifes in case of a car crash but when the Bmw prototype got into that car accident, it went under the truck and when you’re on Autobahn, you’ve also got some speed. I know.. these are sad auto news but we all must know the fact that you can get dangerous jobs at Bmw too and being a test driver isn’t that fun when you die.